While others discuss Talladega Nights: The Ballad of Ricky Bobby, I want to discuss a different Bobby movie. 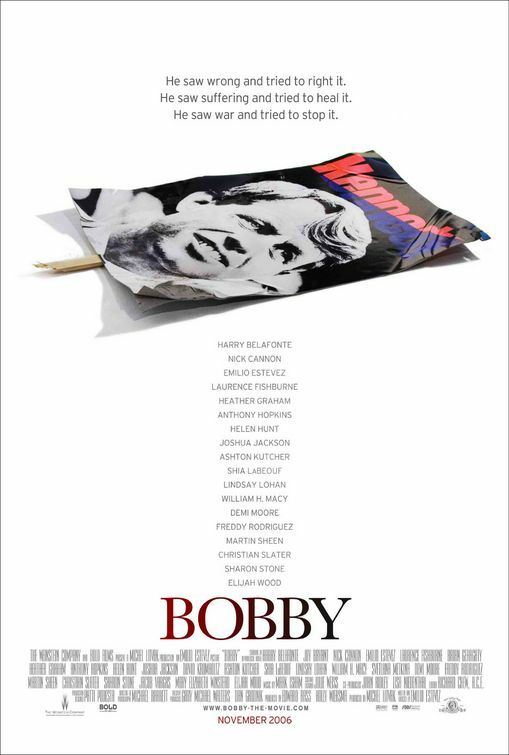 In fact I want to talk about the movie called Bobby directed by Emilio Estevez coming out this November. Emilio Estevez's film Bobby takes place on June 6th, 1968 on the day that U.S. Senator Robert F. Kennedy was assasinated. 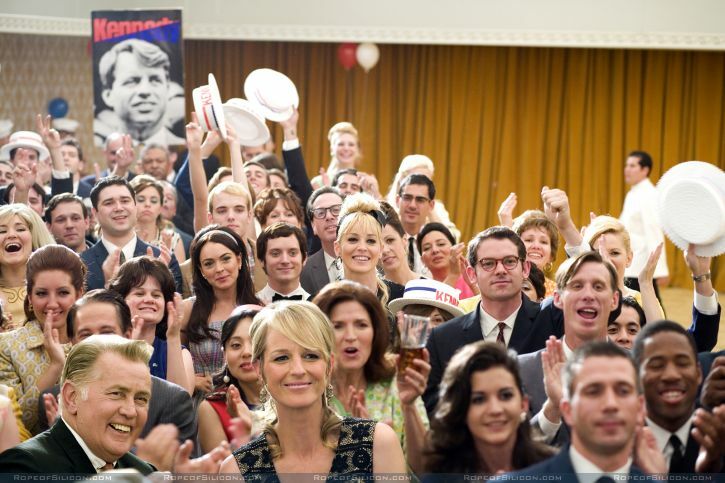 The film seems to focus on 22 people who were at Los Angeles Ambassador Hotel where RFK was killed. The extensive multi-character film cast looks like the cast of Robert Altman's Gosford Park with the most bizarre assortment of film stars including: Helen Hunt, Martin Sheen, Anthony Hopkins, Lindsay Lohan, Elijah Wood, Joshua Jackson, Sharon Stone, Christian Slater, Lawrence Fishburne, William H. Macy, Ashton Kutcher, Emilio Estevez, Heather Graham, Nick Cannon, Shai LaBeouf, Freddy Rodríguez, and Harry Belafonte. But the names that I just listed are the names that appear on the poster...don't tell me...Elijah Wood will be playing the part of Sirhan Sirhan and Martin Sheen will be playing the Senator. Actually unkowns Dave Fraunces will be playing the title role of Bobby and David Kobzantsev as Sirhan Sirhan. Neither of these people's names appear on the poster, so it seems reasonable to assume the plot of this movie has far more to do with the party guest than the actual assassination event. Not to many people are talking about this film now, but it has touches of some of last years big movies. You have a multi-character story (like Crash) you have a modern history event (like Good Night, and Good Luck, although it really takes place more in Munich time period or even the time period of Capote). And yet when I see the early images of this film, it also reminds me of Walk The Line. And while the story is probably not accessible as the love story of Johnny Cash and June Carter, I feel like if Emilio nails it right, Bobby could be a movie that is embrassed by critics and the general audience. I'll be really interested to see how the buzz for this film builds, and I think it has tremendous potential and hope that it is an enjoyable film. Notes: I am glad that we did not try to guess who would play the part of Robert Kennedy as we've done with other upcoming films, we would have all failed misserably. Also, I've mentioned this film briefly in past post about Joshua Jackson's future projects as well as Lindsay Lohan's future projects as well. I'd been wondering when Helen Hunt would resurface - she used to be quite ubiquitious. I remember when Bobby was killed. I was 10 at the time and remember how shocked and saddened I was and my mom as well. We loved Bobby and was sure he;d be prez and a good one, too. 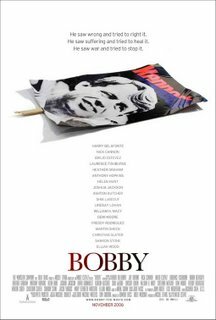 The best Bobby movie I think was the mini series about hi and Jimmy Hoffa, played by Robert Blake. Yes! I really wanna see this movie. I've mentioned it a couple of times on my blog but not as substantially as this. I think this could really sneak up on people and surprise. In my most recent Oscar predix (start of July) I only gave it a costume design nomination, but who knows. Maybe a performance or two? Director even! Wouldn't that be interesting. Emilio Estevez up for Best Director! Thanks for writing about this. I look forward to seeing it! When Emilio Estevez was interviewed last year he said something very interesting; he mentioned how his directorial approach to Bobby was modelled on that of Clint Eastwood, e.g; not shooting more than two or three takes of each shot, trusting your instincts, etc. He seemed very taken with the Eastwood approach and given Clint's success who can blame him. And now Bobby is generating some potential awards buzz. Hmm, interesting. I want to see this movie too. I thought that Emilio Estevez had pretty much become a has-been. This could be his big come-back. I wonder, though, how did he tap Martin Sheen to be in this movie?